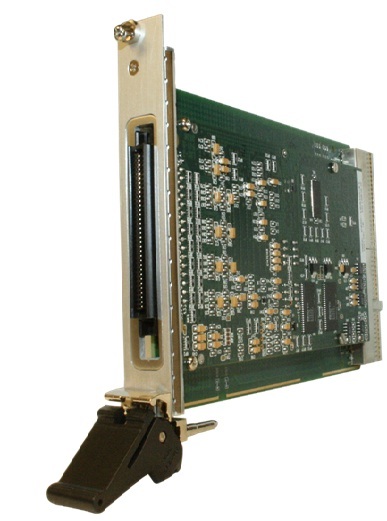 cPCI Multi-Function I/O Cards | Marvin Test Solutions, Inc. The GX3232 is a multi-channel 16-bit, analog input and output cPCI module, supporting 32 single-ended or 16 differential input channels and four analog output channels. The inputs can be software configured for differential or single-end operation and are sequentially scanned with a maximum aggregate scan rate of 300 kS/s. Three input ranges are software-selectable: ±10 V, ±5 V or ±2.5 V. Optionally, the GX3232 is available with a high voltage input configuration and supports three ranges: ±60 V, ±30 V and ±15 V. The high voltage configuration supports 16 single-ended or 8 differential input channels for high voltage and 16 single-ended or 8 differential inputs for low voltage measurement. Four analog output channels provide software-selectable output ranges of ±2.5 V, ±5 V or ±10 V. The outputs can be updated either synchronously or asynchronously and support waveform generation. Each output can be clocked at rates up to 300 kS/s. A 16-bit digital I/O port is also provided, which supports 16 bidirectional data lines. Note that when used with a TS-700 system only 8 of these digital I/O lines are available at the test system's receiver interface. The GX3232’s input channels are sampled sequentially at a maximum aggregate rate of 300 KS/s. Sampled data is accessed via the PCI bus and a 32 K-sample FIFO buffer. Scanned channels can be set for 2, 4, 8, 16, or 32 channels per scan with the sample clock being generated by one of two internal rate generators which employ 16-bit programmable dividers. The four output channels can be clocked at rates up to 300 KS/s and like the input channels, offer programmable ranges. Each output channel includes a dedicated 16-bit D/A converter with output data being clocked from a 32 K sample FIFO buffer, which interfaces to the PCI bus. Output clocking is generated by one of two internal rate generators which employ 16-bit programmable dividers. Sync input and sync output lines are also provided for synchronizing the input and output signals to an external event. These signals are not accessible at the TS-700’s receiver interface. The module supports an auto-calibration routine which applies any required offset and gain correction values for all input and output channels. Additionally, a self-test input switching network routes output channels or calibration reference signals to the analog inputs - verifying module integrity and functionality. The GX3232 is supplied with a Windows® 32/64-bit DLL driver library. In addition, interface files and examples are provided to support access to programming tools and languages such as ATEasy®, LabVIEWTM, and C/C++. Common Mode Rejection 60 dB typical, DC - 60 Hz, differential input mode.